Did you think light bulb moments were random? Discover how to tap into them on demand and how to make sure the best ideas actually happen. You next bright idea to change the world is just one book away. This is kind of expected as tapping into our innate brilliance is what this book is all about and, most specifically, how to do it simply and at any time you like. 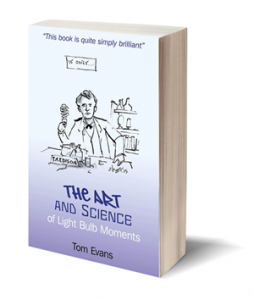 The Art and Science of Light Bulb Moments is an interactive, educational and entertaining guide on how to have ideas on demand. In it I explain how the mind works (and doesn’t work) so that you can experience inspirations about anything pretty much any time you like. Light bulb moments don’t have to be random. You will learn the secrets to Whole Brain and Whole Mind Thinking, the importance of the breath and how to reconnect with your vestigial minds and the superconsciousness. Find out where ideas come from and why most thoughts aren’t necessarily your own. Reading this book will quite possibly change your world by helping you spot serendipities, making you luckier and even healthier and wealthier. 1: What is a Light Bulb Moment? 2: What stops Light Bulb Moments?